The themes of this window are Baptism and the Christian Mission to “Go out into the whole world, proclaim the Good News.” The location, in close proximity to the baptismal font at the entrance to the church provides an intimate introduction to the window. 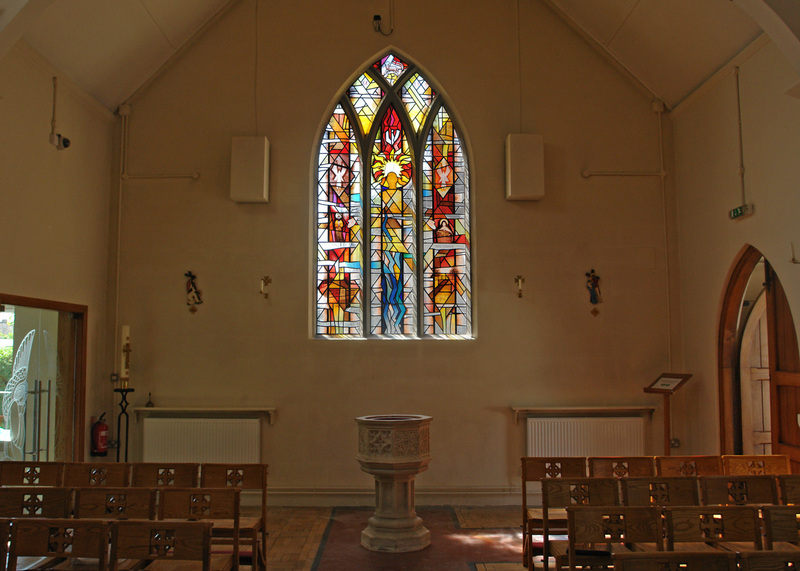 The design uses a restricted colour palette complimenting the colour scheme within the church, including autumnal ambers, browns, creams, reds and yellows, with the background being clear glass to allow lots of light in. The main themes of Baptism and Mission are complimented by a number of other themes also running through the window, including references to the life of Mr. John Ades, the surrounding landscape, St. Jude and St. Therese of Lisieux. 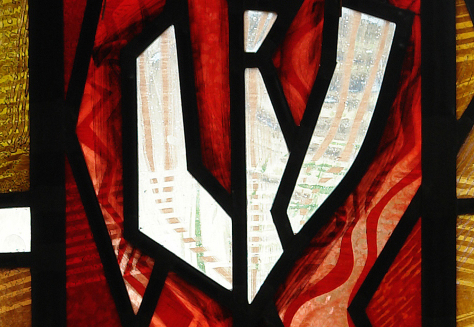 In more detail, the top of the window contains an image of Agnus Dei. This Latin term meaning Lamb of God was originally used to refer to Jesus Christ in his role of the perfect sacrificial offering that atones for the sins of humanity in Christian theology, harkening back to ancient Jewish Temple sacrifices. Directly below is a representation of the Holy Spirit in the form of a dove, referring to the account in John 1: 32 – 34 of the Holy Spirit descending on Jesus like a dove when he was baptized. 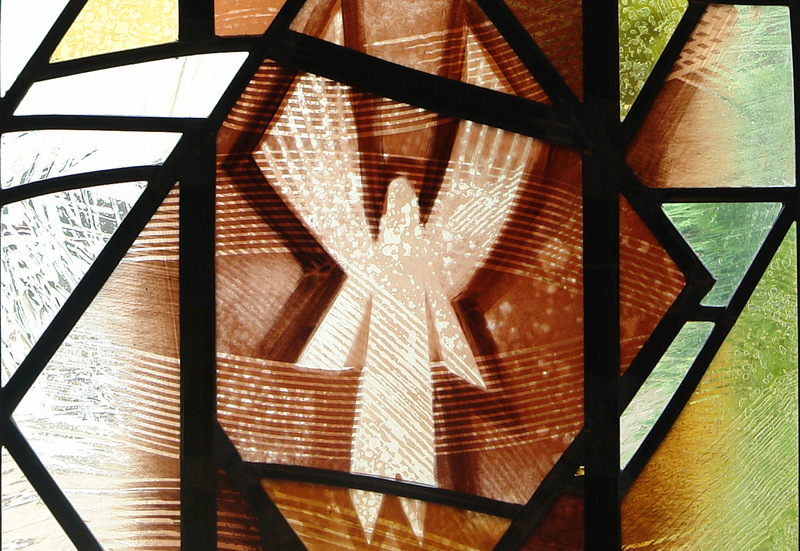 The central section of the middle lancet contains a representation of an angel of the Lord with arms outstretched in welcome and outreach. Below the angel the waters of Baptism can be seen flowing down towards the Baptismal font just below the window sill. 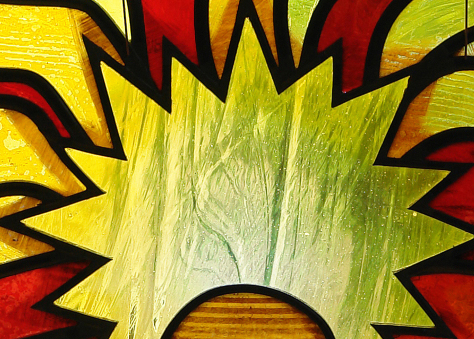 The left hand lancet contains a representation of St. Jude depicted with a flame above his head and an image of Christ held close to his chest. He is the Patron Saint of hopeless and lost causes. Below St. Jude is an image of the Shawfield Centre in reference to Mr. John Ades. 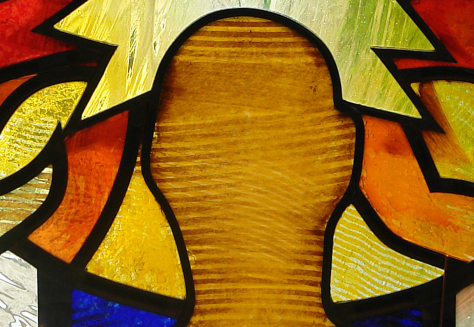 The right hand lancet contains an image of Saint Therese of Lisieux, the Little Flower of Jesus represented with an armful of roses. She is the Patron Saint of Missionaries and Aviators. 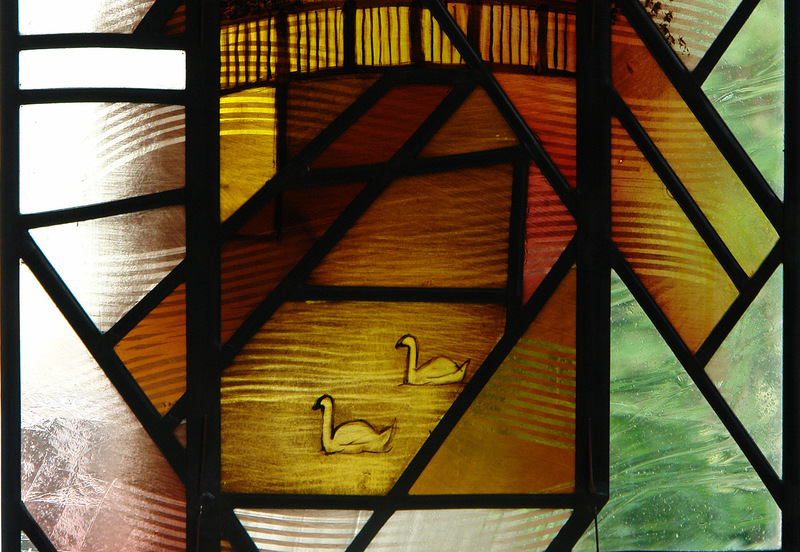 Below St. Therese is a depiction of the local canal and bridge, complete with swans. 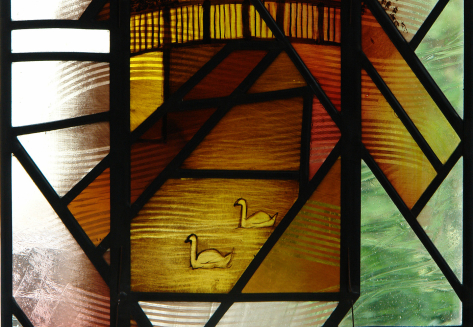 The window is made using a selection of hand made antique glass, fabricated in the traditional manner with lead and solder. The details within the design are to be hand painted and stained, and new non-ferrous saddle bars are to be fitted to the stonework to support the window in position.